I’m way behind on both blogging and beading this week, with a super heavy schedule of work, events, and outings. It’s even harder to be away from my workspace when I’ve got lots of new goodies to try, and this week I’m starting on a project with some awesome bead colors. I just added several new shades of green seed beads to my stash, along with some Czech O beads and other Czech glass accents from Lima Beads. A lot of them are going into a single design – one of the final pieces for my secret project. I’m also including a few favorite druk colors, and a fresh hank of satin blue bugles. I can’t wait to get started! While the words “peace symbol” can generally mean anything - such as an olive branch - in Western culture they bring to mind a very specific shape. You’ve probably seen them on earrings and pendants in every material you can imagine, from wood and plastic to metal and gemstone. 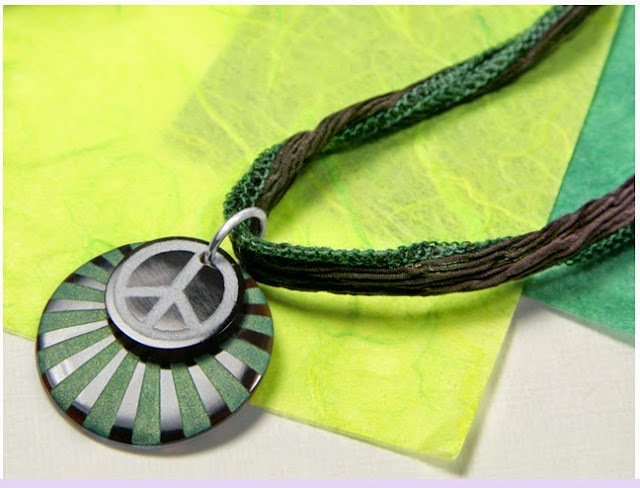 The peace symbol is a very popular motif for jewelry with a retro, groovy, or faux boho style. It often gets paired with the classic happy face, mod flower motifs, and fractal patterns. The story behind the sign is actually a very interesting one. The Direct Action Committee and Campaign for Nuclear Disarmament in Britain needed a symbol for it’s 1958 march on the Atomic Weapons Research Establishment. Artist and designer Gerald Holtom originally created a line drawing in the shape of a person showing despair, with a circle around it. Ultimately wanting a more hopeful banner for the movement, Holtom inverted the symbol. The final design is made up of overlapping semaphore signals for the letters N and D - Nuclear Disarmament. Two years later, the badge was brought into the US by a university student, and it quickly became the unifying symbol of both disarmament and anti-war groups across North America and Europe. Do you have any peace symbol jewelry in your stash? For the past few weeks I've been getting a lot of use out of some new-to-me bead colors that I ordered just a short while ago. I needed some interesting new shades of blue and red, and was really happy with what I found. This week, I'm trying out some new matte blue Miyuki's and loving them. Along with topaz, Montana blue, and jet black, I'm very pleased with how the new color looks in the weave. I'm not usually a fan of matte finish beads, because I find the texture too "crunchy" for close beadwork. They also tend to soak up the gray reside from Smoke Fireline, especially in the lighter colors. I couldn't resist the few shades I did pick up, as the matte finish makes for some wonderfully sophisticated colors, making any texture issues worth it. Work on my top secret project is almost complete. I'm really looking forward to making totally new designs, and sharing them as well! Hopefully I'll have some of my new bead colors left to play with. Once the craziness of December is behind us, things will be back to normal, and I hope to finally start work on the thread comparison I meant to do this year. The meat and potatoes of any beader’s stash is most often lovely and versatile seed beads. They’re essential for beadweaving, ideal for bead embroidery, make great spacers, and can add a delicate touch to a variety of jewelry styles. Today’s guest, Gina of FusionFrenzy, shares her favorite things about beading’s tiniest materials. Inspirational Beading: What is your all-time favorite bead? Why do you like them? 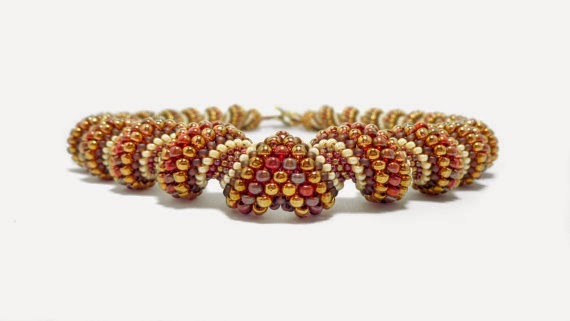 Gina: My all-time favorite beads are Miyuki Japanese seed beads. They're so versatile with all the different sizes and colors, the creative possibilities are endless. I love how uniform Japanese seed beads are. The end result is a very consistent looking piece. 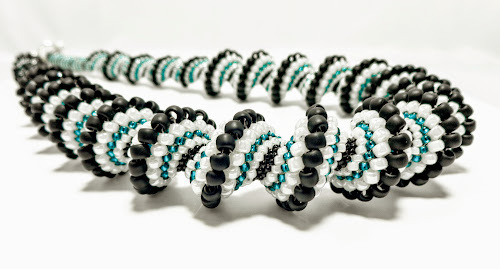 Inspirational Beading: What is your favorite technique or method to use them? Gina: My favorite technique... that's a tough one! It's a toss-up between Cellini spirals and tubular netted pieces. If I had to choose only one, I'd pick the Cellini spiral technique. Although they are extremely time consuming to make, the result is an incredibly detailed piece. It leaves non-beaders wondering how you made it. I love that the shape of the spiral is dictated by the order and size of the beads you choose. As a personal preference, I try to keep my spiral shape on the conservative side, not too drastic. I don’t usually use any bead larger than size 8 for my Cellini spirals. Inspirational Beading: Of all the creations you’ve made with these beads, which one is your favorite? 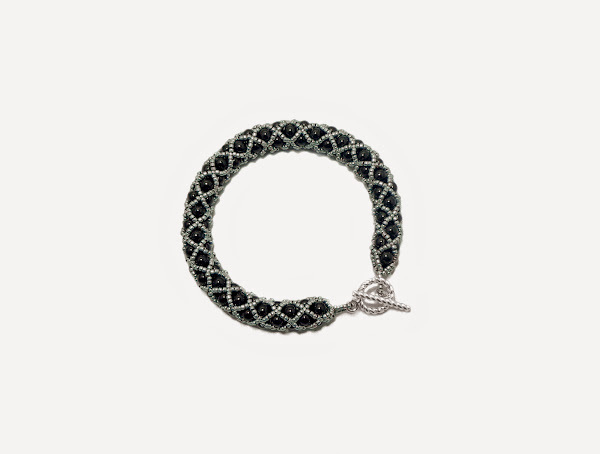 Gina: My favorite seed bead creation is a Cellini spiral necklace incorporating three seed bead sizes in four colors. It was the first time I reversed the spiral halfway to create a unique focal point. I'm really pleased with how it turned out. It was an ongoing project. I started a few months ago, planning for fall colors. I put the project aside for a while… honestly I got distracted by other bead projects! Recently I decided to finish what I started. My only concern was that the tension wouldn’t be the same, but thank goodness it turned out perfect. I used tension that was not too tight and not too loose. The result is an even tension throughout the necklace. Inspirational Beading: Do you have any tips for making the most of these beads? Gina: Keep an open mind when it comes to color. I was surprised what colors actually work well together. Sometimes, I’ll just start beading something and if I don’t like it, I simply undo it and start over with different shades. Don’t be afraid to play with color. I also recommend to try and keep a good inventory of colors and sizes. Before starting a new project, I let color inspire me so having a variety to choose from is great! I will literally lay out a bunch of bead packs in front of me. Certain colors jump out and grab my attention. If nothing else, keep a good supply of black. Black goes with everything. I understand building even a small inventory can take time and money. I started building mine by asking for gift certificates to my favorite online bead stores for any birthday or Christmas gifts. Inspirational Beading: What is your favorite bead or material to pair them with? 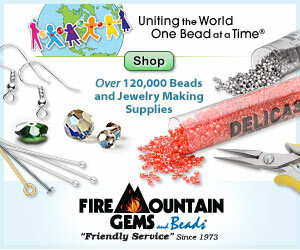 Gina: I love to pair seed beads with round Czech glass beads or fire polished Czech glass beads. They're perfect to use in my second favorite technique: tubular netting. Just like seed beads, Czech glass beads and fire polished Czech glass beads come in various sizes and so many beautiful colors. 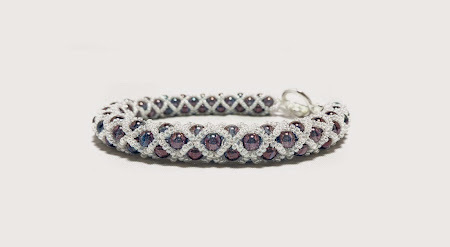 I surprised myself with how beautiful my capri blue and metallic brown netted bracelet turned out. Inspirational Beading: If you were stranded on the moon, and you could have only one kind of bead with you, would you choose seed beads? Gina: I would choose seed beads without hesitation! In fact, I usually bring seed beads with me anytime I'm going to be away from home for as little as one night! No kidding, if I could find a way to neatly bead while riding passenger on a road trip, I would do it. I keep telling people beading is just a hobby, but recently someone told me it was more of an obsession. The more I thought about it, the more I agree. I would be perfectly content being stranded on the moon with my seed beads. Of course, it would be even better if I had some string, a needle, and air to breathe haha! Since I use seed beads, I would never run out of projects considering the amount of stitches and techniques that are out there. You're truly only limited by your own imagination! Inspirational Beading: What’s your favorite method for storing your bead collection? Gina: I have a zippered fabric craft bag with a handle on it that stores all my seed beads, well, the seed beads that I have plans to use in the near future. I also have a decent supply of seed beads that I keep on shelves that I don’t use all the time. They’re always on that shelf if I need them. I keep all the beads in the original bags they come in so I know exactly what size, amount, and color they are. I go even further than this though… I use ziplock bags to separate the sizes. One bag contains all size 15 beads, another bag contains only size 11, etc. This way, they all stay organized and easy to find. By the way, this is also my to-go bag. If I’m going away, all I have to do is grab the handled craft bag and be on my way. It’s like my bead supply purse; everything is in there ready to go. Never leave home without it! Inspirational Beading: Do you have a brand preference? In your opinion, what is the best source for them? Gina: I prefer round Japanese seed beads. They work well in all my projects and the beads have a very consistent shape. I’ve used other brands where some beads were thinner than others from the same pack… it just drove me crazy trying to sort them out so my project would be uniform. I usually buy beads online from various sites. I seem to find a better quality online for reasonable prices. I’m not fond of the seed bead quality at my local craft stores. There are a couple drawbacks to ordering online though. Sometimes the colors you see on your screen are not quite the exact same colors you receive. What you thought was a very light yellow turns out to be a little on the darker side. There is also the lack of instant gratification and even the quickest shipping seems slow when all you want is to get started on a new project. On the flip side, it feels like it’s your birthday when the package finally arrives! It is so much fun to open it up and finally hold and see what you ordered days ago. I get a kick out of that if you can’t tell! 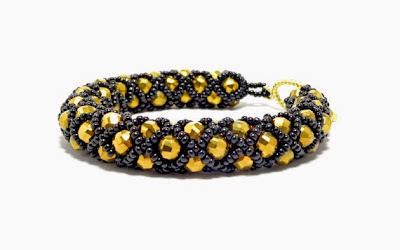 You can see more of Gina’s seed bead creations and jewelry designs in her shop, FusionFrenzy, and get news on the latest projects on the FusionFrenzy Facebook page. The only thing better than getting a new package of beads in the mail, is getting a surprise package of beads. There’s something so exciting about the mystery of a blind bag, the discovery of something new, and the chance to try a different material without having to choose it yourself. I love it when indie bead shops include a few samples in an order, and I’m a huge fan of bead grab bags from Auntie’s Beads. They always have a varied selection of goodies at a great price, so when there’s a sale, I try my best to get my hands on one. There’s always a chance that there will be beads or components that I can’t use, which means I get to pass on the goodness to my fantastic readers. I recently stocked up on some shaped seed beads and a few favorite 11/o colors, and got a new grab bag with my order. There were a lot of lovely goodies in the bag, and I’m giving them all away! This month I’ve got two strands of 4 and 6mm magenta glass pearls, and a strand of (I think) pink matrix jasper rounds. They look good enough to eat! How to Enter: For a chance to win all of the beads shown, leave a comment on this post telling us your favorite colors to pair with pink. One lucky winner will be drawn on Wednesday, November 12th. Rules: Comments must be posted directly at InspirationalBeading.Blogspot.com to qualify, but no log-in is required. Please make sure to leave a contact method in your comment if you do not have a profile with a public email address. For security, you can type your email like so: username AT yourmail DOT com. Incomplete or duplicate entries will not be included in the draw. Update: This drawing has closed. Working on my new Tutankhamun collar this month reminded me – as these projects often do – of one of my very first Egyptian beadwork pieces. When I did the math, I was a little surprised to discover that it was over nine years ago that I made this embroidered portrait of Tutankhamun’s decorative sarcophagus. The design was so complex – I traced it from a photograph in one of my Egyptian history books – that I ended up just beading right onto the paper. There’s still a good portion of it hiding under the beads. I was able to tweeze out most of the edges, but the middle is there to stay. I’ve been thinking of doing some more intricate Egyptian bead embroidery, but I never seem to have the time to commit. Maybe next year! This week I’m really excited to be working on a piece with a very Egyptian inspired palette. I’m putting my new rainbow ruby seed beads to good use, along with cobalt, turquoise, and topaz standing in for gold. The palette is fashioned after the broad collar on Tutankhamun’s funerary mask. It’s one I’ve been meaning to do for ages now, and I can’t believe that I waited this long. I suppose part of it was fussing over a pattern, but I finally found the perfect stitch to use. I’m already several hours into the project, and it’s coming along very nicely. I love the antiqued look that the ruby beads bring to the beadwork. I only wish that I had some turquoise Picasso to match. This one is part of my big secret project - the reveal is only a few months away! I’ve made a bit of a tradition of whipping up a simple necklace to go with my Hallowe'en costumes each year - which gives me a chance to make a little something for myself, while trying out techniques or materials that I wouldn’t normally use. Last year’s rifle pendant is still my favorite, although I lost the necklace somewhere. I’m still pretty annoyed about that, but I made up for it a little by throwing together an old daisy chain with another toy gun just in case I’m in the mood to wear it. This year’s necklace was quick and easy to stitch up, especially because I had just the right focal waiting, as luck would have it. Months ago we were set on going as The Doctor and Donna Noble from Doctor Who, but changed our minds. My son decided on Pinocchio from Shrek, leaving me with a tough choice to make. I toyed with a lot of different ideas, until I realized that all of them required wearing a skirt or dress. I was running out of time when one of my favorite YouTube channels, albinwonderland, posted a tutorial for skull makeup. 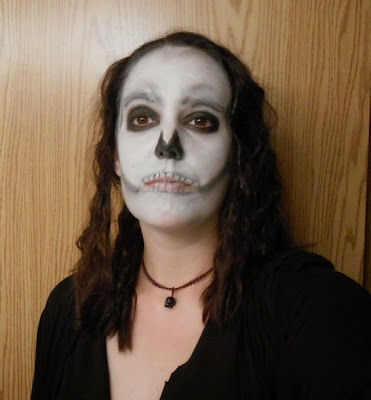 When I realized that I could just paint my face and wear whatever I wanted, everything else fell into place. I decided to go a little more scary than posh, and thought it would be easiest if I told people that I was going as a lich. That meant I needed a phylactery – a magical object to store one’s undead soul. And I just happened to have a Swarovski crystal skull hanging around to do the job. I didn’t manage to get a good photo until the end of festivities, when most of my makeup was smudged, but I think it turned out great. We had a fantastic Hallowe'en, and now I’ve got another great necklace for my stash. Do you like to dress up for Hallowe'en? What did you go as this year?